Solutions offer an easy way to select and use predefined sets of filters and actions to accomplish complex tasks. To select a Solution first select the category of the solution from the Solution menu. This is the list of categories for the solutions. 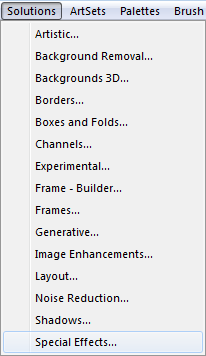 This is the same list from the Solution menu. This is the list of specific solutions in the selected category. 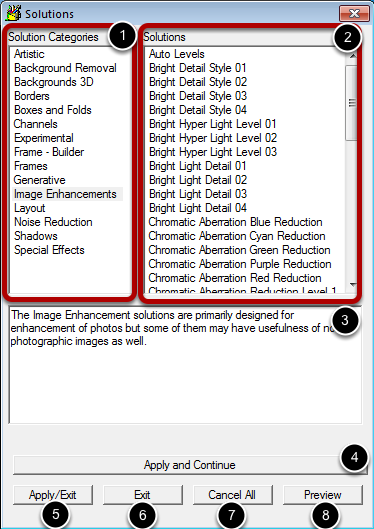 A description and usage guide for the solution category is shown here. The Apply and Continue button will apply the current solution and keep the dialog open ready for additional solution applications. The Apply/Exit button will apply the current solution and exit the dialog. The Exit button will close the dialog without further changes. The Cancel All button will canal all the solutions that have been applied since the dialog was opened. The Preview button will show the currently selected solution.